I love flowers, but I struggle with drawing them. As you can see. 🙂 Admittedly, I only had a half hour to get this drawing finished. I love the colors, but I don’t think flowers are something that comes easy to me. I will have to try, try again before I’m happy with them, I think, but they’re worth it. If anyone can suggest a book or a video that’s helped them render flowers and leaves, I’d love to hear about it. Woo, I’m glad we’re within sniffing distance of the weekend. I’m gonna celebrate Friday tomorrow by going back to eyes, my favorite subject! Spread some joy around today, and I’ll see you Friday. I think this is a good start. Maybe the edges of the leaves should be more well-defined with the same density of color inside as the flowers themselves (more white showing) and I don’t know if you even need the stems. The shape without them is quite graceful. Flowers are hard for me right now, though I seem to have been better at them at one time. Just keep drawing them! Thank you! Good point. Yeah, I won’t stop. I can’t stop apparently, lol, and if I haven’t got the essence of something, my brain won’t let go until I do. True! It is strange, discovering this in mid-life, such a strong pull. Where has this been the past 20 years? No one knows. You get a lot done in half an hour. Thanks. I try to go faster when I feel less confident. It seems to help. Even though that makes no sense. Maybe it causes less interference from the left brain? Also, my husband was waiting for me to watch a movie and so I was rushing more than normal, lol. Do you ever use the “drawing plane/drawing viewfinder” that Edwards talks about? I never have. Have you? Not really. I keep trying to skip ahead in the book to see how she talks about it. I think it has something to do with making a 2D image our of a 3D scene. But the book is structured so that you really need to go through the whole thing. Very nice, I love the colors! 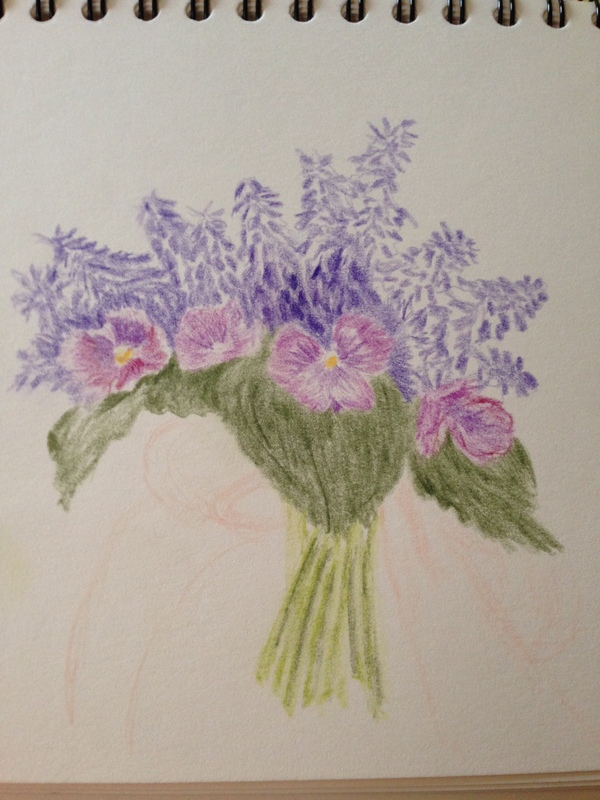 Flowers are so hard to draw or paint… You did a great job! I’m glad to hear they’re hard for everyone, Ann, and thanks for the compliment. I almost didn’t post this, but I love the colors too, and hey, at least this way I can see my progress with flowers….as I sloooowly improve lol. I find flowers really hard to paint …. the purple ones here are good! Thank you! Yeah, those little grape hyacinths were a bear. I need lots of practice with flowers, apparently, but I’m dying to watercolor them, so I need to be able to draw them first.